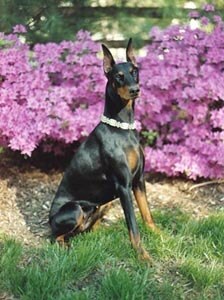 Thaler’s AKC registered name was Destiny’s No Checks Or IOUs. 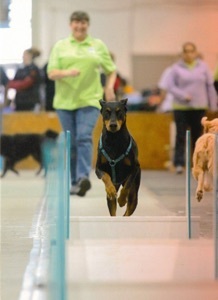 Thaler earned her Flyball Onyx title in November 2009, her FDGCh Grand Championship in January 2011 and her FDGCh-40K in May 2012. In addition to flyball titles, she has earned her Breed Championship, her Canine Good Citizen, her Rally Excellent, Companion Dog, Freestyle and Nosework titles. 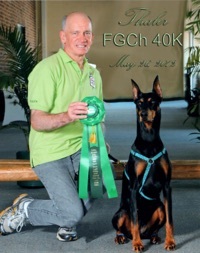 Thaler was also awarded a ROM (Register of Merit) from the Doberman Pinscher Club of America. 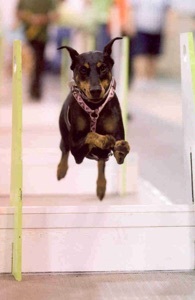 To be awarded a ROM, a Doberman must be a breed champion, have a performance title and pass a WAC (Working Aptitude Certificate), which is a Doberman specific temperament test title. 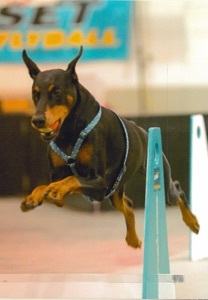 In a WAC, a Doberman must progress from accepting a neutral stranger, tolerate close proximity gun shots and other stimuli, walk over various types of terrains and warn off an attacking aggressor who is waving a club. 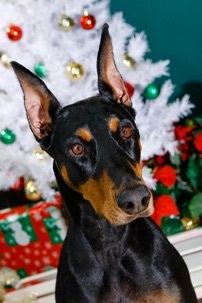 Outside of flyball, Thaler competed in freestyle, modeled (she has been featured in Doberman calendars since she was 12 weeks old), and K9 nosework(c) . 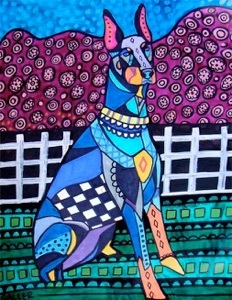 She lived with Don and Linda Grskovich, her Doberman roommate and buddy Broker and an occasional Doberman rescue dog. Thaler crossed the Bridge on October 27, 2016.